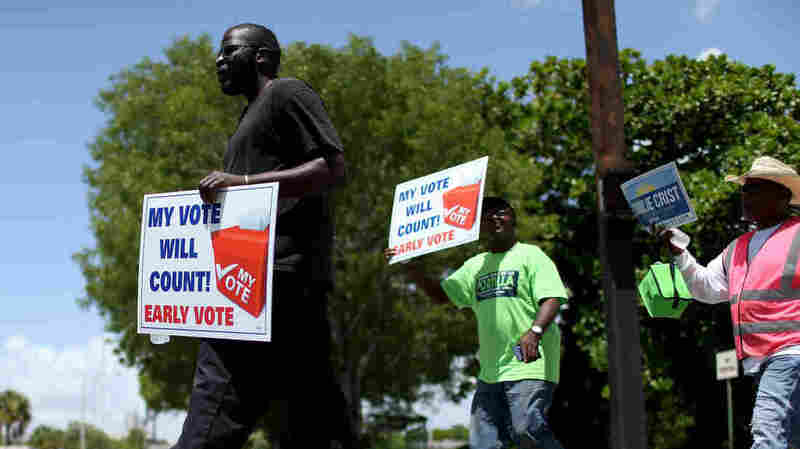 As Election Nears, Voting Laws Still Unclear In Some States A federal appeals court in Ohio just upheld a decision extending early voting in that state — but several other big voting law cases are still undecided, just weeks before the midterm elections. Voters walk to an early voting site to cast their ballots on Aug. 11 in Miami. On Wednesday, a federal appeals court in Ohio upheld a decision extending early voting in that state. Meanwhile, as Election Day nears, courts are still considering cases about early voting in North Carolina, and voter ID requirements in Texas and Wisconsin. "Voters and elections officials need to know what the rules of the game are going to be several weeks before the election," says Daniel Tokaji, an election law expert with the Moritz College of Law at Ohio State University. But right now in several places, they don't, he says. For example, arguments in a lawsuit challenging the Texas ID requirement wrapped up on Monday. But it's not clear when U.S. District Judge Nelva Gonzales Ramos will make her decision. And no matter what she decides, it will almost certainly be appealed, although as of now, the ID requirement remains in effect. Tokaji says the case could end up before the Supreme Court. "I think in Texas it's really difficult to say exactly what's going on," he says. But Myrna Perez, with the Brennan Center for Justice at New York University and one of the attorneys challenging the law, says she's confident her side will prevail. She thinks the plaintiffs presented compelling evidence that the law discriminates against minority voters, who are less likely to have the required government-issued photo ID. She also says many voters face a burden getting an ID because of the cost of related documents. "For example, Miss Sammie Bates testified that she would have had to make a choice between feeding her family and presenting the money that she needed to get a birth certificate in order to get the identification that she wanted," says Perez. Bates, who is African-American, told the court that the $42 birth certificate fee was an obstacle. But attorneys for the state say that most voters have the right ID. And for those who don't, there are alternatives, such as casting an absentee ballot. The dispute over voting rules is stark and emotional, so while the lawyers are debating, political campaigns are using the issue to fire up their bases. A campaign ad for North Carolina's Republican Senate leader, Phil Berger, touts his role in passing that state's new voting law, which requires a photo ID by 2016. "Voter ID prevents fraud and protects the integrity of our elections. It's common sense," Berger says in the ad. Although there's little evidence of such voter fraud at the polls, public opinion surveys show that these new laws are popular. Republicans have been the main proponents. On the other side, Democrats and voting rights groups say the laws hurt minorities and others who tend to vote Democratic. They've been using the issue to get those voters to the polls. "During this 2014 election season, voters must be vigilant about their voting rights, particularly as states continue their voter suppression efforts, " says Barbara Arnwine of the Lawyers' Committee for Civil Rights Under Law, one of the groups opposing the state laws. The groups are also trying to make sure that confusion over the rules this fall doesn't prevent legitimate voters from casting ballots. Already, in Wisconsin, a last-minute decision requiring photo ID has thrown the election there into turmoil. Daniel Tokaji says that turmoil could lead to even more litigation. "In the event of a close election, this could be a real mess," he says. Updated on Sept. 25 to include the Ohio federal appeals court decision.